I was really happy to find this ad for many reasons. I have been trying to piece together the history of the Halloween-candy connection, and this ad has some important clues. The separation between “Halloween candy” and “trick or treat favors” is interesting. Presumably the former is more appropriate for refreshments at Halloween parties. The butter cream corns (candy corn), Hallowe’en butter creams (think Brach’s Harvest Mix), and orange and black kisses are just like the kinds of candies we would choose for a Halloween party today, orange and black and seasonal. 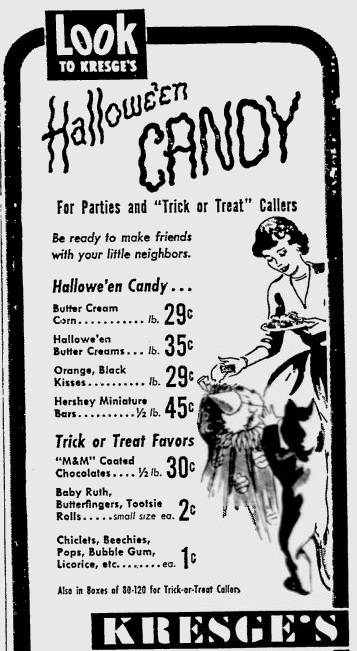 Despite this division between party candies to fill the bowl and “trick or treat favors,” I think it was not uncommon for the loose “party” candies to also be offered to trick or treaters. In fact, the candies listed for trick or treat are not all wrapped; licorice pieces and M&Ms would be loose, and ad suggests that other types of candy are also offered at 1 cent per piece. The insistence on portioned and pre-wrapped candy as the only acceptable trick or treat offering comes much later. One puzzle: Why wouldn’t mini-Hershey’s be included for trick or treat? Perhaps at 45 cents a pound, it was a little too much for kiddie give away, it seems the candies under “trick or treat” are the cheaper ones. Another thing that I learn from this ad: I didn’t realize that the “mini” size candy bars were available so early. Packaging for trick or treat that I have seen from the 1950s typically is something closer to what we would consider a full size serving. I also notice that for the party candies, “butter cream corn” is at the top of the list. I’m finding newspaper ads for Halloween including what we call candy corn as the first item featured for Halloween beginning around the 1930s. We think of candy corn as THE Halloween candy, and it is interesting to trace the history of that association. I’ll publish a more detailed account of candy corn later. The image of trick or treat in this ad is fascinating. The candies are for “Trick or Treat Callers,” transforming the pranksters and gangsters of the 1930s and 1940s into genteel visitors come to pay their respects. The woman appears the most gracious hostess, offering a plate of delicacies to her diminutive guests. Handing out candy is a way to “be ready to make friends with your little neighbors.” It is as if the trick or treating exchange is to the benefit of the hostess, who is implicitly worried about making a good impression on the neighbors. Entry filed under: Children and Candy, Holidays, WWII to 1960s. regarding unwrapped candy, when I was a small child a lot of the candy I collected were unwrapped things, and apples as well. As time passed, more and more things were factory wrapped and I believe pressure created by the hysteria of “razors hidden in apples” made the apples and unwrapped candies disappear. I can still remember the excitement I felt when some old lady gave my sister and I a square of “Violet Candy” because it was something new and different. so I am certain it was not wrapped. Thanks for pointing that out, I spent the morning with that ad and I didn’t even notice! Whew, they are tricky!